Born on April 2, 1966, in Sverdlovsk (now Yekaterinburg). In 1991, graduated from St Petersburg State University, the Faculty of Oriental Studies, the Department of Near Eastern Studies, the Section of the History of Afghanistan. From 1991 to 1995, doctoral student at the St Petersburg Branch of the Institute of Oriental Studies. In 1997, defended the PhD Dissertation, Pragmatic Islam of Nakshbandiya Brotherhood. On Basis of Persian Written Sources from 12th to 16th Century [Прагматический суфизм в братстве Накшбандийа (на основе персидских письменных источников XII—XVI вв. )], supervised by Dr O.F.Akimushkin and Dr S.M.Prozorov. From 1997 up to present, researcher at the Department of Middle Eastern Studies, the IOM RAS. 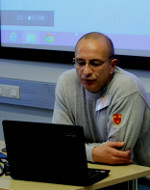 Several times Dr A.Khismatulin visited Iran and worked there as an interpretor. Islam, Islamic mysticism (tasawwuf/sufism) in Central Asia, mediaeval historiography on Central Asia and source criticism, Muslim textology and theory of translation. Due to the 3 days mourning in St. Petersburg, the lecture by Dr. A.G. Kozintsev, chief researcher at the Department of Anthropology of the Museum of Anthropology and Ethnography (Kunstkamera), RAS, Humour - on the Way towards General Theory, is postponed till May.